Y’all, I have been going through so many older cookbooks lately and discovering lots of yummy new-to-us recipes. 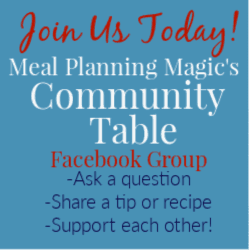 You know those ones that are compilations of recipes submitted by group members—maybe a church group, moms club, work friends, kind of thing? There’s a reason those recipes were submitted—because they are usually family favorites. One thing I’ve noticed though is that in the older cookbooks, they’re not always the healthiest recipes. So I’ve enjoyed trying new recipes for my family and tweaking them to make them a bit healthier for my family. 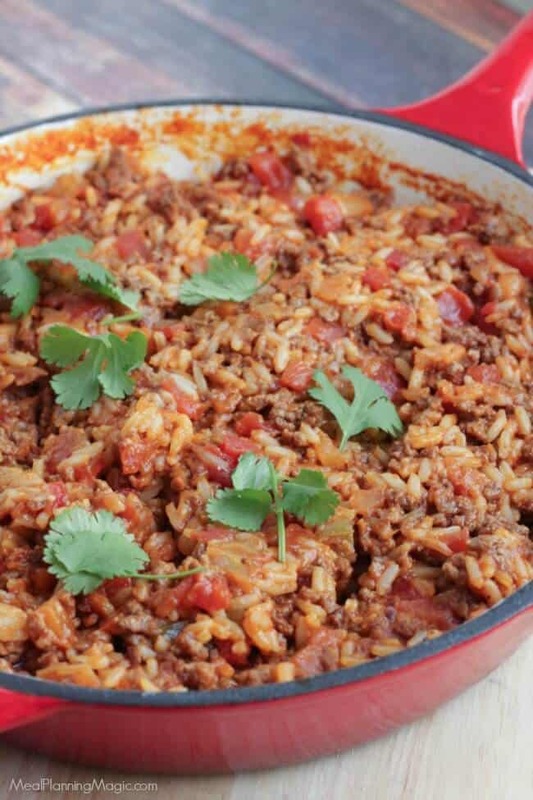 This week I’m sharing a recipe for Spanish Rice and Beef Skillet. Recipes like these are perfect for busy weeknights because they can usually be made in 30 minutes or less and since everything is made in one pan, there is less cleanup. Those kind of recipes are always a double winner in my book! 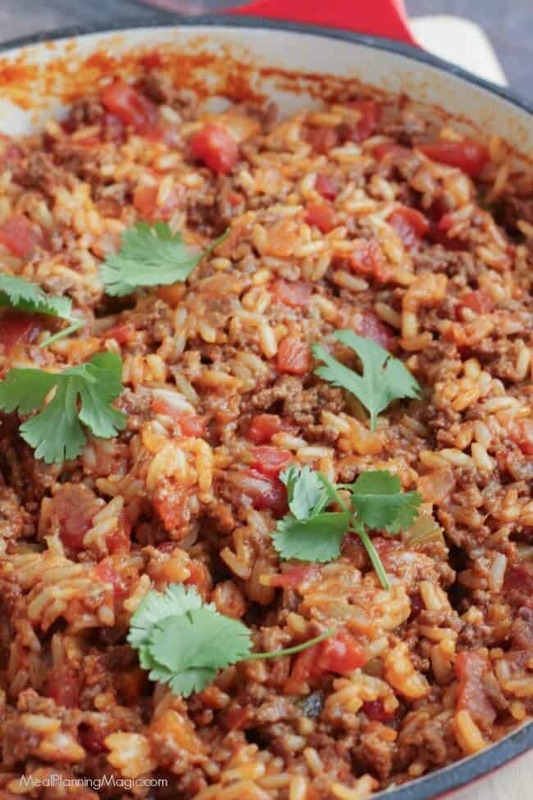 I love the flavors in this Spanish Rice Skillet—think of it as a Spanish fried rice without the stir-fried part! I could eat the whole pan myself and it makes good leftovers for lunches too! 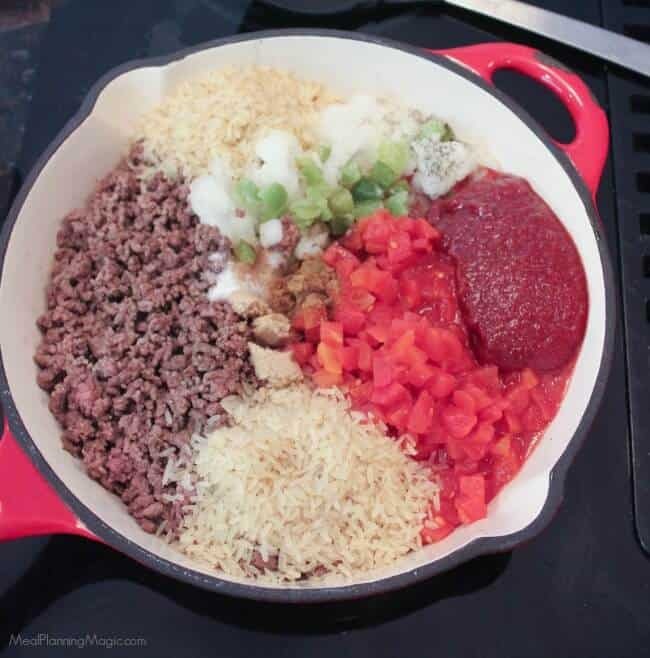 In a large skillet, brown ground beef. Drain excess fat from skillet. Stir in remaining ingredients, onion through black pepper. Simmer for about 30 minutes, stirring occasionally. Stir in shredded cheddar cheese. Today, I’m also sharing other skillet recipes from fellow Sunday Supper Tastemakers that are perfect for just about any time you want a quick and easy meal. 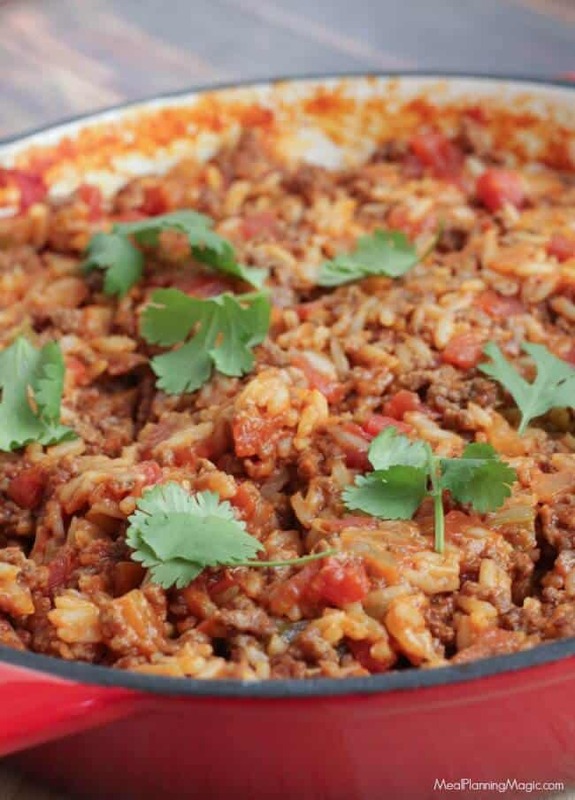 I know I can never have enough of quick and easy recipes so I hope you’ll try my Spanish Rice Skillet and be sure to check out the recipes below from my fellow food bloggers! I love perusing those types of cookbooks, too! Thanks for putting a healthy twist on this dish for us! It looks wonderful! Thanks Liz! And yes, there really is a reason why those cookbooks have the best recipes–because they are family favorites!